Food is one of the great pleasures Vitoria-Gasteiz has to offer, keeping up a rich tradition while forging ahead with modernity and adapting to new trends. It is precisely diversity that characterises every aspect of the city, making it a little gem of extraordinary exquisiteness. 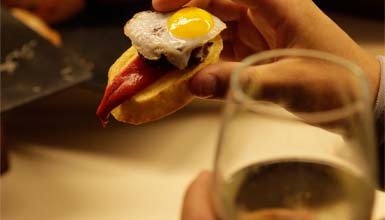 In the centre, El Sagartoki (Calle El Prado, 18) offers you a miniature snack made of potato purée with bacon and egg yolk inside to make it into very solid food; while at El Clarete (Calle Cercas Bajas, 18) you can find a variety of traditional dishes with a personal, signature twist to achieve a fine result that you're sure to remember for a long time. If you believe that less is more, El Rincón de Luis Mari (Calle Rioja, 14) is the place for you and Antxopi is what you are looking for. 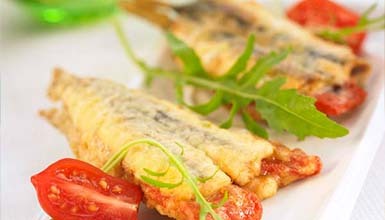 A simple but delicious piece of bread topped with pepper, anchovy, boiled egg, a touch of mayonnaise and olive oil. It's impossible not to be captivated. Precisely because Vitoria is a city packed with dualities, PerretxiCo (Calle San Antonio, 3) on the other hand creates a puzzle in which the most traditional ingredients fit together perfectly with a modern touch in its pintxos to create a cuisine characterised by its harmonious variety. For its part, the lively Calle Dato is home three unmissable bars: the Saburdi, the Usokari and the Regadera. You'll be hooked on the cod ajoarriero (with garlic, oil and paprika), while the delicious titbits in the Usokari and the Regadera will reel you in.